Today I went to a local car boot, which I’d never known of before until Jen over at A Little Bird Told Me posted this! She gives a link to a really useful site that lists car boots and markets in your local area, so I checked it out and discovered a car boot no more than ten minutes away from my house! I regularly visit my local flea market most Tuesdays, and have always wondered if there was something similar held on Sundays. Now I have found one, which will no doubt become a regular haunt of mine! Dan took me down to have a look this morning, and I was pleasantly surprised at some of the goodies I spied! 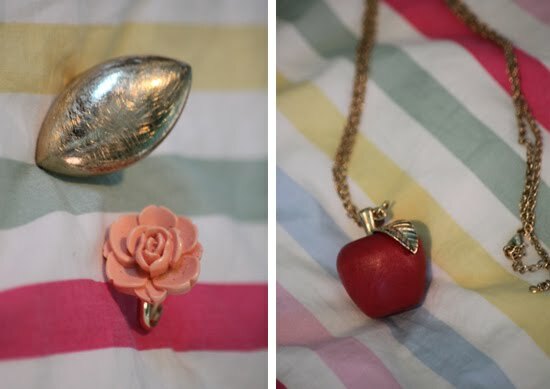 I saw a beautiful vintage style Singer sewing machine in pristine condition, but my favourite finds were on a little jewellery stall, run by a lovely old man! I picked a few bits from his stall. All of the items I got were £1 each. I probably could have bartered but I really couldn’t be bothered. Ha! At least I’m honest. 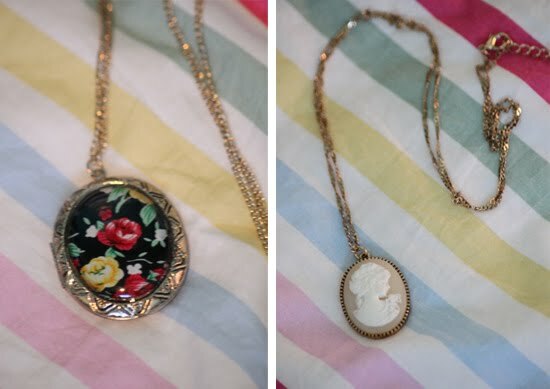 I got these two vintage style necklaces, one is a large locket with a floral centre, and the other is a lovely cream and white cameo on a long gold chain, perfect to wear with an Autumnal colour palette. I’m a big fan of rings at the moment, stacking them on lots of fingers, so when I spotted these two I was very happy. The first is a chunky gold tribal style ring that looks so much nicer on than it does in the picture! The second is a gorgeous little peach flower ring. Both rings fit my lanky fingers perfectly! Finally, Dan spotted this quirky apple necklace, that reminds me so much of Snow White. The red apple is made from wood, and has a gold leaf on top. It is really unusual and would be great in a photo shoot! Hope you like my purchases. Do you have any car boot bargains? "STYLING: ALICE IN WONDERLAND INSPIRED SHOOT"
"A WEEK IN MY WARDROBE [23/08 – 29/08]"
I'm ashamed to say I've never been to one, but so many bloggers are raving about them at the moment that I might have to go and hunt me some bargains!! I haven't been to a carboot sale in years.. I'm desperate to start getting back into it.. I know of a couple relatively close to me, but they're still driving distance away, & I don't drive & can't convince anyone to come with as yet – I'm going to keep trying though! The flower ring is cute. Great finds! It has been years since i've been to a carboot sale. By the look of things, i'm missing out!